Valiant’s 2016 Convention Tour Hits Denver Comic Con with Exclusive Merchandise, Panels, and More! Next weekend, the Valiant 2016 Convention Tour is kicking into overdrive for Denver Comic Con – and we’re bringing along mountains of merchandise, programming, panels, and the best-reviewed comics in the industry! From June 17th to June 19th, visit the Colorado Convention Center in booth #885 for an adrenaline-fueled trek through the top superhero universe in comics with a complete selection of Valiant trade paperbacks and deluxe hardcovers for award-winning titles, including X-O MANOWAR, FAITH, DIVINITY, RAI, HARBINGER, ARCHER & ARMSTRONG, NINJAK, and many more! And don’t miss every piece of Valiant merchandise exploding out of Denver, including t-shirts, toys, and more! Plus: Become an overnight expert on the world of armor-busting Visigoths, nanite-fueled commandos, elite super-spies, and more on Saturday, June 18th at 11:00 a.m. MDT in room #401 for VALIANT 101: NEW FANS START HERE! 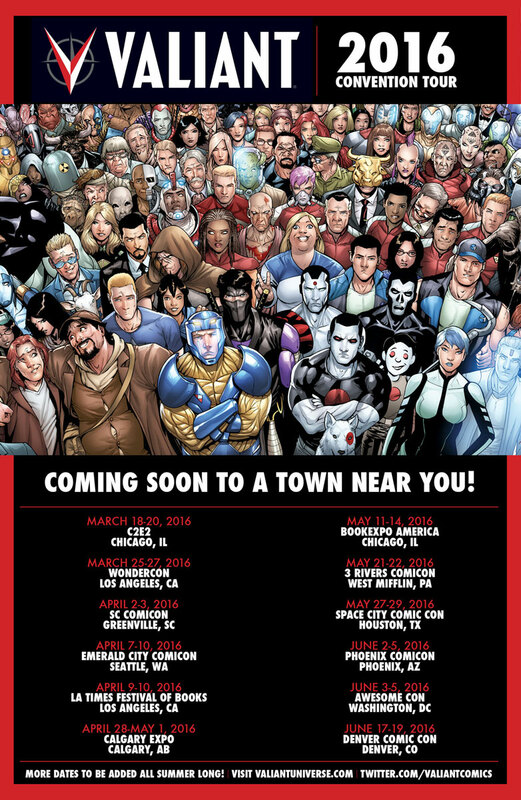 You’ve heard the buzz… You’ve seen the reviews… Now find out where to start with Valiant Comics! From X-O MANOWAR to NINJAK to FAITH and ARCHER & ARMSTRONG, jump on board here with a concise and fun-filled introduction to Valiant’s biggest, most memorable characters…and find out for yourself why Buzzfeed calls Valiant “a universe full of your new favorite superheroes”! Then, Valiant’s weekend in the Rockies is blasting sky-high on Sunday, June 19th at 11:00 a.m. MDT in room #401 for Valiant: The Summer of 4001 A.D! This summer…the future of Earth will be decided in the stars when Valiant presents the blockbuster crossover event of the year in 4001 A.D.! Now, get primed for the epic showdown between Rai and the forces of New Japan right here! Plus: Don’t miss an all-new round of news and announcements for ARCHER & ARMSTRONG, BLOODSHOT REBORN, DIVINITY, FAITH, NINJAK, X-O MANOWAR, and more!